A devastating soccer injury sent Simen's life into a spiral. He went from the star athlete to a rehab regular. The rehabilitation included weights, which turned out to be a blessing in disguise! Up until three years ago, I only played handball and soccer because they're the most popular sports in Norway. I was good and had a solid reputation built around my skills. All of that was torn away during a soccer match when a goalkeeper jumped on my knee and bent it backward, tearing my outer right ligaments and my anterior cruciate ligaments. Doctors told me to never play sports again. This was very hard to handle. It was all I knew. I ran to the bathroom and burst into tears when I got the news. It was quite the change going from seven weekly practices and weekend tournaments to nothing. I felt completely empty, like there was nothing out there for me anymore. I just sat at home, staring at the wall, watching the days go by. But, luckily, my fysiotherapist changed everything. My knee needed to recover after surgery. The therapy included lots of ropes and weights. The ropes were the most boring activity I've ever done, but the weights blew my world wide open. The feeling you get for the pump is unbelievable. I knew this was it; my next big thing. I fell in love and my passion has only grown since. I don't follow a specific program at the moment. I try to make every week look different than the last. I maintain a one-minute pause between sets depending on how I feel. Bodybuilding gives me the opportunity to stick out in a way that isn't very common. Some people dedicate their time to get good at soccer, school, or work. Personally, I think those things are regular and boring. Why not live your dream? Why not give it everything you got and achieve something spectacular. I like people staring at me when I enter a room. For me, that's the ultimate goal. I won't settle for being "just another fit guy." Phil Heath motivates me the most. His story is incredible. 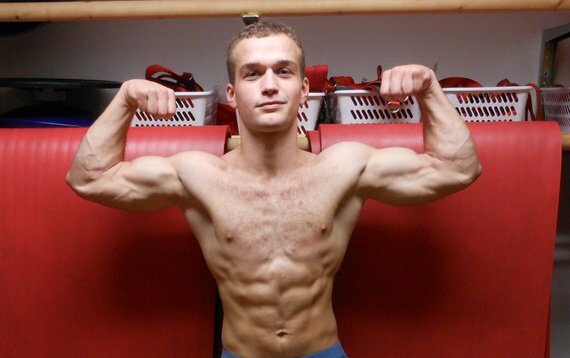 Going from an average basketball player to the world's greatest bodybuilder is almost inhuman. His body is totally insane. I would certainly like to look like him someday, although I doubt I have the same genes. I'm a good self-motivator. I don't need support from friends or family to keep me going. When I feel down or unmotivated, I watch YouTube videos of famous bodybuilders giving it all they got. I also read about Arnold's story. Music is an important factor that motivates me to train. I have a variety of music I enjoy lifting to, but believe it or not, orchestra is my favorite at the moment. Two Steps From Hell - Heart of Courage and the Pirates of the Caribbean soundtrack are worthy of a listen. I also enjoy looking at pictures of Phil and Jay to get me motivated. I really want to move to Oslo, Norway to compete, but since I'm still in school, that's out of the question. Leaving my friends will be tough, but it's the price I'm willing to pay. I guess I'm just going to keep killing it at the gym and putting on lean mass. Getting a job is also a priority, so I can purchase more of the right foods and supplements. Just do it. If you feel like this is something you can be good at, do it. Don't let anything hold you back; not your parents, teachers, or friends; no one. It may be hard explaining why you spend hours in the gym or bring meals with you. People don't understand bodybuilding, but when they see the results they'll stop asking why and start asking how. Phil Heath is my idol. Not only is his body perfect, he's a good and fun guy. I don't know him, but from what I read, see, and hear, he's a hell of an athlete who always has time for fans and thanks his supporters. The way he came in and dominated the sport is just outstanding; from traning with Jay Cutler in his early years, to beating him at the 2011 Mr. Olympia. 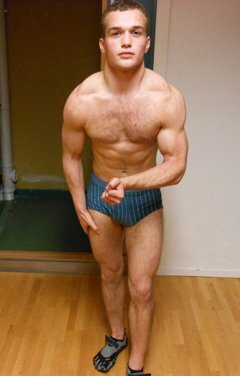 Bodybuilding.com fuels me with knowlegde and inspiration. I visit the site many times a day and find something interesting every time. The members and the staff play a role to form the world's best fitness site.